2P START! Live! 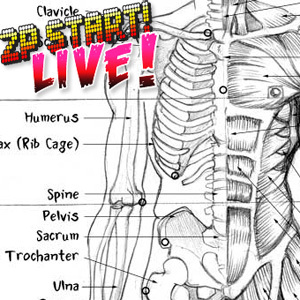 : Anatomy of a Comic Edition | 2P START! In this episode, you’ll hear a thorough discussion about the mixed reactions of this week’s comic, the constant struggle in trying to balance jokes each week, a Black Doom Award based off of a good idea (? ), and what advice Ray has for clothing stores….. The Black Doom image randomly shows up about half way through the Rise From Your Grave segment. The Musical Misfits image was also mixed up with the Anatomy of a Comic image. Not that big of a deal, just interesting. Nice podcast as usual, guys. I don’t really have anything I really want to comment on, but I enjoyed the podcast, and the Skype calls were awesome again. And I really hate mentioning Rouge without any good transition, but oh well. GUEST COMIC!??? I have a few ideas we can run by you Tim, if that is possible . As long as I get a spot on the podcast after it. I get your reason for the Back doom Ray, even though I don’t have the web for my Wii. Hey, I’m commenting on a podcast!! Its been a while. Uhh, I should probably get around to calling in as well, but the time zone thing makes it tough. Anyway, good questions this week. About the comment, it seems that whenever someone doesn’t like one of your comics, they always assume its the death of 2P Start! It never makes sense. Ok, weird. I just finished typing the sentence when Ray said the exact same thing. Creepy. Pretty cool remix. I’m digging the video game sounds towards the end of that demo. Duh Ray! It’s safety! Millions of children could fall prey to pedophiles if only one friend code was necessary! It’s be a market suicide and drive away the younger market. Yay! Pokemon music during Tim’s BDA. And of course, functionality is really stupid and unnecessary as long as you’re having fun! This one time, my brake pedal wasn’t working, but I had fun so it didn’t matter. Ok, just by looking at the cover for this game (Gitaroo Man) I really want it. Luckily, my roommate next year has a PS2, so maybe its not impossible. And the song is really good too. Has a FLCL feel to it and I love the guitar tone. I like that clothing idea. Would definitely help me, since I only know white goes well with anything. Also, I just saw the T-shirt ad on the side and realized you’ve been promising new T-shirts for quite some time now. Just saying. Good episode! Also, I’m “Wising fwom my gwave”. Been reading for quite a few months now. I took the time out one day to read every single comic and can honestly say that VERY few were somewhat weak. I love how much you guys connect with your audience and the insights you gives us into both how you make the comics and your personal lives. I downloaded PixelVision and was blown away with the quality of the music and how much it screamed old-school megaman. It’s things like that which set this apart form other webcomics. Keep up the good work! Oh also for Musical Misfits, a bunch of songs from the Ace Attorney series! Yay. So…I’d appreciated it if someone would “moderate” my Musical Misfits suggestions. Thanks. I guess I’m rising from my grave. Haven’t commented since some of the first podcasts (near the end of the Trivia For You), even though I’ve been here even since the first comic. And have essentially listened to every podcast and read every comic, and read the game reviews to boot. Also, when are those coming back?! Excellent Music Nisfit! Makes me feel a little stupid, because I’ve heard it before, but I never even thought of suggesting it. My Musical Misfit suggestion is not as good as this week’s, but it’s still cool. It’s another theme from the Earthworm Jim franchise, but this time it’s from the original game. Earthworm Jim. PC version. In the OST I got with my game, the theme is called “Falling”, but it’s better known by the name “Use Your Head”, after the level it’s from. I’d like the “Bachelor” set of clothing. Excellent choice. Comes with a bundle of soiled shirts, dirty jeans and ketchup for staining. Waitaminute, waitaminute…. how can you give a Black Doom Award to Wii Friend Codes? Without Wii Friend Codes we’d never HAVE 2PSTART!! Actually, if there werent friend codes and instead just regular online like XBL then it would have been easier for Ray and Tim to meet probably. OK Black Doom Award for next week. Oh GOD. Barbie Horse Adventure 2?! Couldn’t you sit on a balance board to get the same effect? Clearly going to be used as a mechanical bull lovely horse. Go perfectly with that beer pong “party” game. Friend codes are definitely epic fail. The Guitar Hero 5 folks said recently they could have done this from the beginning because it’s “all in the SDK”… really? From the beginning and even Nintendo is too lazy to use it?! Nintendo needs to form an online-focused team to impose proper use of online functionality. MS imposes their graphics standards, text-readability standards, and how online works. I don’t know why Nintendo can’t too. If the rules get laid out clearly and a product can’t go gold without those measures being met, then we’ll finally have functional coherent online. Speaking of friend codes, ever consider doing a 2P Start game night for online gaming with your readers/fans/enemies? Oh, wow. I’m really sorry about that first comment thing, Ray. Looking back, I was a little rude, and I would like to apologize for that. With the idea you had, you did the best you possibly could. You didn’t waste six hours on the comic. But thanks for the great comics and podcasts so far, guys! Looking forward to the next comic. And no, the death of 2P Start is no where near, I was just tired and over-dramatizing things at the time of writing the comment. Oh, also, I was having some problems with the podcast in iTunes. It didn’t have any audio past the Skype part. I ended up downloading it from here, though, so it’s fine now. My iTunes version worked fine; maybe your download was interrupted or something? I actually downloaded it twice, and the same thing happened. It could have been a problem with my iPod, I don’t think I tried it in iTunes. Anyway. I only listened once so far… So I didn’t get all the jokes. And you got a point there… I hate it when someone tells a joke that uses a punchline nearly nobody knows, and laugh loudly himself. Friend codes… I don’t know… the only Wifi game I play is Band brothers DX and Digimon World Dawn for DS… And I don’t need them. Sounds like a hard-to -use thingy to me in the podcast. And I have a question here. Does anyone know a famous video game character that have NO alliance or friends? I want to use him as the head character in my sprite comic. Olimar is close if you don’t count the Pikmin, but then he’s pretty useless. Maybe Samus? I haven’t played any Metroid games, but with my limited knowledge on the series I don’t know of anybody besides her. I’m thinking of Tingle now… I wonder? And My sprite comics comes random, no story lines. So it will only be one comic per topic. Samus has the Galactic Federation which pays her and whatnot. Technically shes a bounty hunter, but its definitely an alliance. And the correct name is “Ms. Pac-Man”, although do the two ever appear together, or is the only connection their name? No, Samus for all but two games really has no help on her missions, but she is contracted for them. And Ridley is affiliated with the Space Pirates. Samus really is as close as you are probably going to get to a video game character that isn’t associated with anyone. Wait, how bout Mr. Game and Watch? He doesn’t have a Mrs. Game and Watch like Pac-Man (as far as I know), and there really is nobody but him in those games. R.O.B. might fit as well, but he didn’t originate as a character, so I think Mr. Game and Watch fits better. But yeah, as far as more current characters, Samus is probably the closest you will get. Hmmm…. Samus… could be a good one. Can make some extreme punchline. I’m also considering Tingle from LoZ now, wht do you think about him? Yay! Now I am risen! Please excuse me for a moment while I wash off the deadness smell. Acually, I have gotten through the campaign episodes (I’m on, like, #75 right now). I just forgot to mention them. I must say that I happen to be a hardened Raypublican. Not because I’ve jumped on the bandwagon with the flood of people who didn’t want to support a racist, but because I give full support to Ray’s CBS (Campaign for a Better Sonic). Don’t be too hyped about your website’s value. Evidently my blog and webcomic (both “wordpress.com” sites) are collectively worth upwards of $5000 according to that site you linked us to. Really good podcast again guys! I enjoyed the remix and misfit a lot. Good choices Ray! Is this a foreshadow for Project Natal? And for those who can’t follow that reference, please see 2P Start comic Endless Possibilities. What do you mean moderate your musical misfits roadjcat?? and I find it interesting your second post’s time is 3 minutes before your first post. I suggested Musical Misfits, but it says that the post is awaiting moderation. And sorry about the two posts, it said the first didn’t go through. Great podcast guys, I had a great time listening to it. @Ray – Don’t you think that your Black Doom Award should go, instead of to Guitar Hero 5, to every other Friend-Code Enabled Wii game? After all, GH 5 is the only one doing it right. Also, Ray…I can has 2P Start! Collectors Edition Set? I think it was supposed to be to Nintendo. I’ve been visiting 2p Start for a long time now, so I don’t know why I never registered, but Ray’s pick for musical misfits this week made me register to show my appreciation. Gitaroo-man is one of my favorite cult classic games, and I even bought (imported) the original soundtrack for it. It’s that close to my heart. So there you go Ray, you have risen the dead by use of videogame music. Wouldn’t happen to have The World Ends With You would you? But you can buy the TWEWY soundtrack off iTunes. I have a couple songs. Shweet. Been digging for it in the local stores but no one had it. Also looking for Killer7 and No More Heroes. I think the only videogame soundtrack I have that came from the US is “Smashing LIVE!” which is the Melee soundtrack. Thanks for the referral. I actually have a lot of imported soundtracks to video games. For a while (2 years) I was in a situation where I could not play video games or see movies at all. I could use the internet for about an hour a week however, and I had a CD player so I was able to order a bunch of my favorite video game sound tracks. I’ll have to see what all I got and list them in the forum. I would absolutely buy that clothing pack. Night vision goggles, Sonic hat, AND a This is How I Roll shirt? I’d be in the business of hot chicks surrounding me, and business would be great! Good podcast and from now on anytime there’s a bad 2p Start comic I’m still gonna bring up the Mario steroids comic in stead of this past Pac Man comic. @ Snifit – HaHa! I shall beat you! I summon…Mega Wait! Yes, I actually thought that it was a good and funny comic. Not the best, but most definitely not the worst. Also, Ray, you said that this was a landmark episode. Well, what about Episode 100? Are there going to be any big festivities for that? Contests? Guests? Parties? Tournaments? I thought Mega Wait was funny too. Off the top of my head I can’t think of ANY comics I didn’t like. Every comic is gold, no no, PLATINUM! A quick suggestion for Musical Misfits. The PS3 makes a horrible coaster. It is curved on the top. My obscure suggestion for Musical Misfits is from Castlevania: Harmony of Dissonance (GBA). It’s the name entry music! My parents had a cleco-vision which we played when we were very young. My favourite video game came out well before I was old enough to play it. My dad was better then us for the first several years at Donkey Kong country, it was my mom I think (might have been dad) that figured out how to beat the first level of Bomberman 64. More recently my grandparents just beat me at Wii bowling. I will admit it, I skipped the musical misfit. only reason I was listening to them is to catch the end of show stuff.